Electrical resistivity is a measure of a material’s property to oppose the flow of electric current. This is expressed in Ohm-meters (Ω⋅m). The symbol of resistivity is usually the Greek letter ρ (rho). A high resistivity means that a material does not conduct well electric charge. If the electrical field (E) through a material is very large and the flow of current (J) very small, it means that the material has a high resistivity. in which σ is the conductivity of the material expressed in Siemens per meter (S/m). In electrical engineering often κ (kappa) is used instead of σ. Electrical resistance is expressed in Ohms, and is not the same as resistivity. While resistivity is a material property, resistance is the property of an object. The electrical resistance of a resistor is determined by the combination of the shape and the resistivity of the material. For example, a wirewound resistor with a long, thick wire has a higher resistance then with a shorter and thinner wire. A wirewound resistor made from a material with high resistivity has a higher resistance value then one with a low resistivity. An analogy with a hydraulic system can be made, where water is pumped through a pipe. The longer and thinner the pipe, the higher the resistance will be. A pipe full with sand will resist the flow of water more than a without sand (resistivity property). The resistance value of a wire is dependent on three parameters; its resistivity, cross-sectional area and length. Nichrome and Constantan are often used as resistance wire. Look in the table for material resistivity for commonly used materials. in which Rs is in ohms. The film thickness needs to be uniform for this calculation. Often resistor manufacturers increase resistance by cutting a pattern in the film to increase the path of the electric current. Electrical resistance of a sheet depends on length, width, film thickness and resistivity. The resistance can be increased by cutting a pattern in the sheet. The resistivity of a material is dependent on the temperature and is normally given for room temperature (20°C). The change in resistivity as a result of temperature change is described by the temperature coefficient. For example thermistors make use of this property to measure temperature. On the other hand, in precision electronics this is usually an unwanted effect. 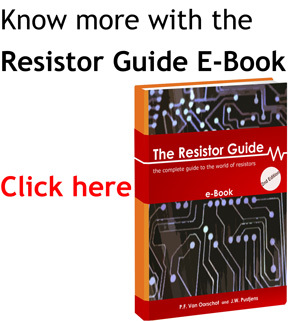 Metal foil resistors have excellent properties for temperature stability. This is reached not only by the low resistivity of the material, but also by the mechanical design of the component. Many different materials and alloys are used for resistors. Nichrome, an alloy of nickel and chromium, is often used as resistor wire material because of its high resistivity and it doesn’t oxidize at high temperatures. A disadvantage is that solder doesn’t adhere to it. Constantan, another popular material, is easily soldered and has furthermore a low temperature coefficient.